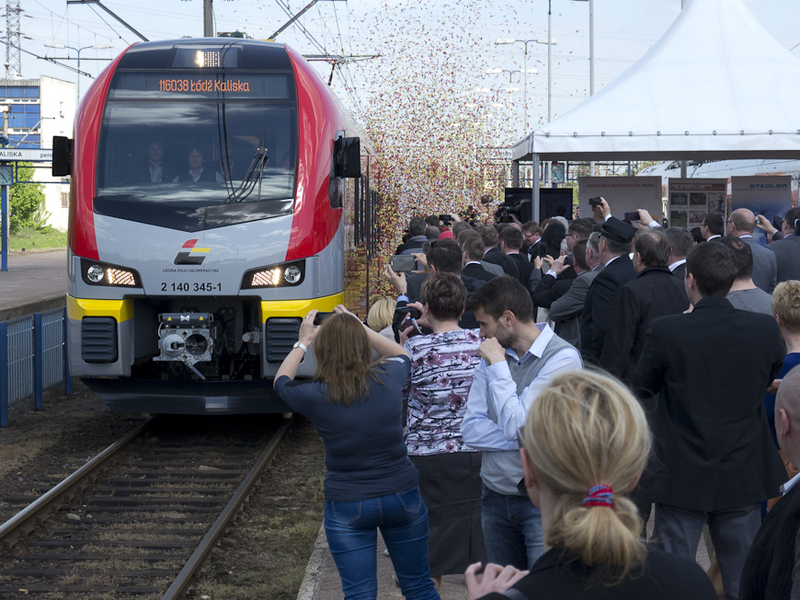 The first Stadler FLIRT EMUs have arrived in Lodz. 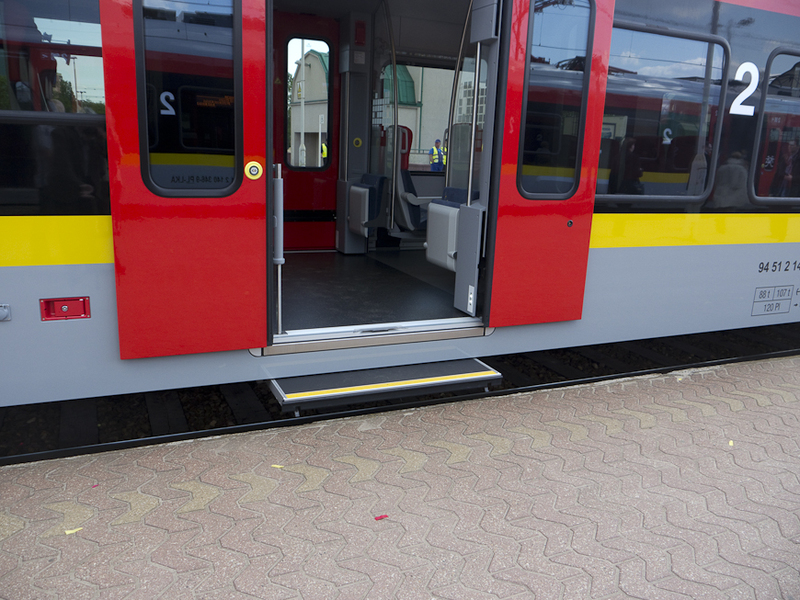 They are part of an 110 million euro project grandly called “The Building of the Lodz Urban Area Railway system” (Budowa systemu Lodzkiej Kolei Aglomeracyjnej). 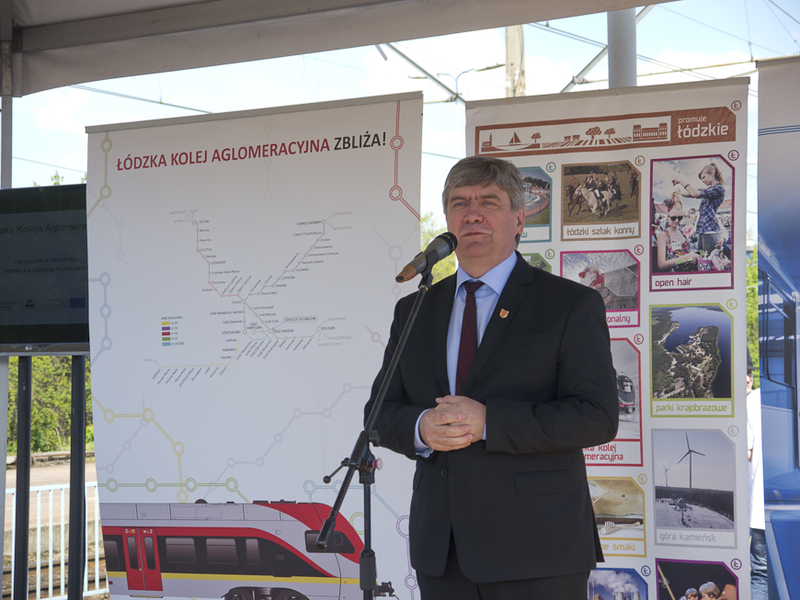 The project is actually nothing of the sort – no new railway lines, urban or otherwise, are being built – but does include the purchase of 20 two-car FLIRT EMUs, the construction of a maintenance depot on the site of the erstwhile Lodz Widzew marshalling yard and a 15 year maintenance contract for the EMUs. The EMUs will operate services from Lodz to Sieradz, Kutno, Lowicz and Koluszki. The first of these, Lodz-Sieradz is due to start on June 15. A number of old stations have been refurbished and a a few entirely new stations have been built. 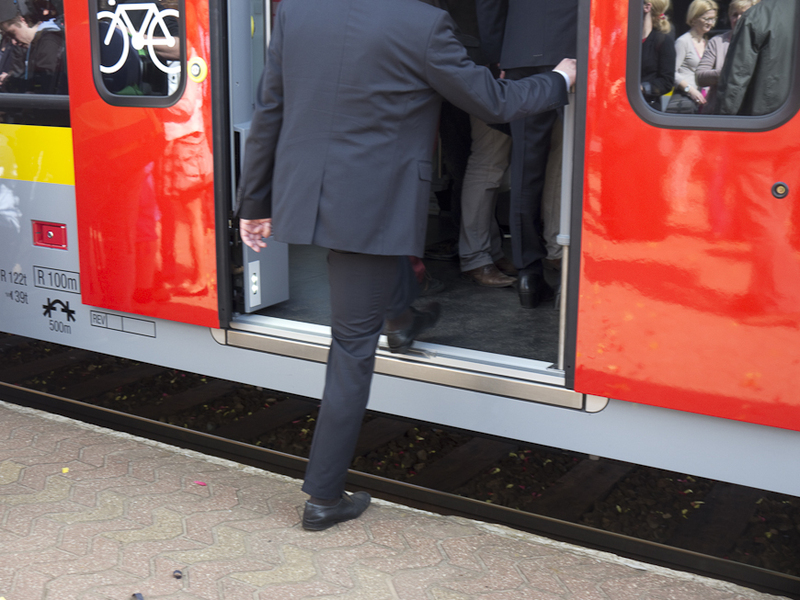 On 30 April, 6 units were displayed to the inspection of the public and press at Lodz Kaliska Station. Inspired by the name FLIRT (Fast Light Innovative Regional Train) Questia, the PR company which managed the event, decided to give the ceremony a wedding theme. And so, in keeping with the spirit of the occasion, here is our slightly tongue-in-cheek report of the proceedings. The celebrant anxiously awaits the arrival of the bride and groom – Witold Stepien, the Chief Executive of Lodz Province gets ready for his speech. Photo BTWT. The best man frets – Andrzej Wasilewski, Chairman of the Lodzka Kolej Aglomeracyjna, delivered the second speech. Photo BTWT. Here comes the bride! 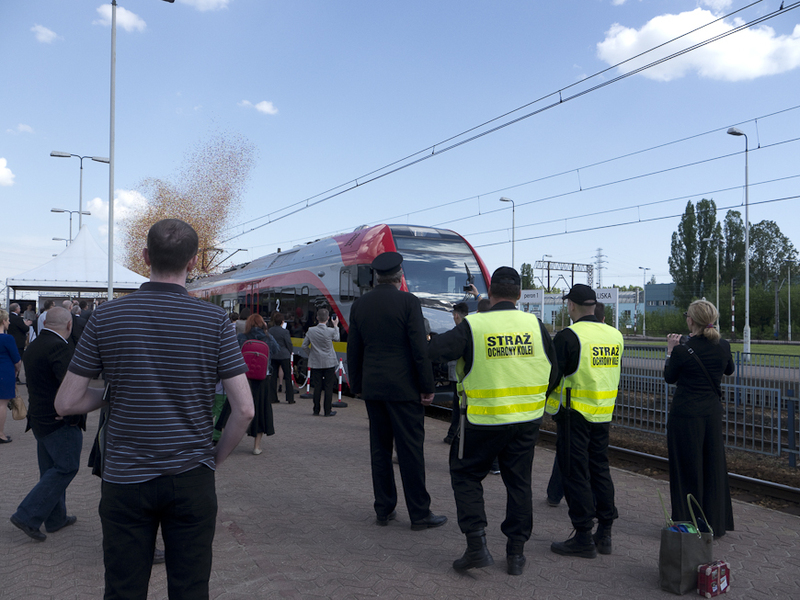 Security guards and a railway man spoil the view as the first train consisting of 3 two-car EMUs arrives at platform 2 of Lodz Kaliska station. Photo BTWT. Followed by the groom! The second train arrives on the other track. Photo BTWT. 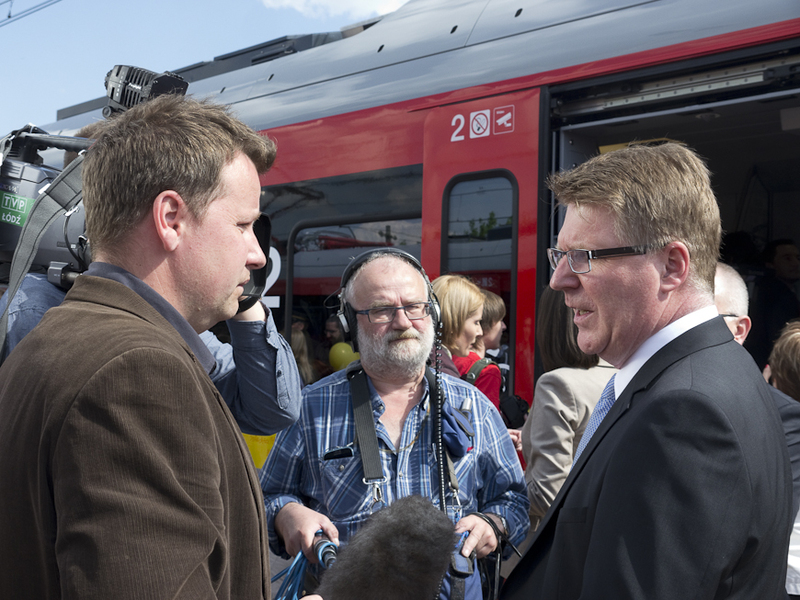 The groom is relaxed – Christian Spichiger, Chairman of Stadler Polska and Vice Chairman Stadler Central Europe, talks to the media. Photo BTWT. The happy couple – Christian Spichiger and an unknown admirer. Photo BTWT. Everybody wishes the couple a long and happy future – another bright idea from the PR company. Photo BTWT. The 1970 – 90s re-building of Lodz Kaliska left the station with low platforms. Photo BTWT. Getting on board is much easier when the step is extended. Photo BTWT. 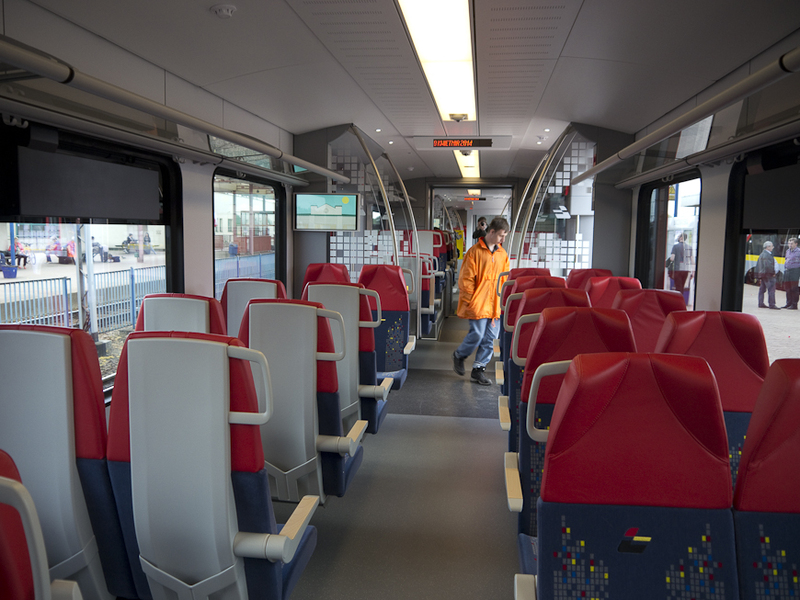 Stadler are to be congratulated in meeting the provincial government’s requirement of squeezing in the maximum number of seats and, at the same time making them very comfortable. Photo BTWT.